Discover l'Occident, a seafront house to rent in the Somme Bay, France. The Occident is a family house that can accommodate 10 people (5 bedrooms). Soak up the maritime atmosphere of this small fishing port where the traditional fishermen’s houses mingle with the holiday homes. The house is oriented South West 260 ° and swept by the gentle winds of western marine and protected from the winds of the North. 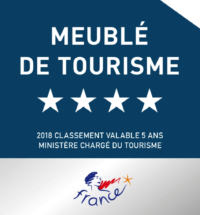 Classified 4 stars by the Ministry of Tourism. The house of 250 m² consists of 5 bedrooms; Equipped kitchen (American fridge, cooker “the retort”, citrus press, coffee machine, teapot and dishwasher). A double living room, dining room, a TV room, books, documentation on the region and DVDs are at your disposal during your stay. A terrace of 100 m² with direct access to the beach and a garden with a garden of 200 m² in the back. A junior suite (with bed 140cm) with private shower room and WC. A master bedroom (with a double bed of 180cm – or 2 beds of 90cm -), living area, small balcony, library and study. A children / teen room with desk (with a bed of 140cm) with balcony on the bay. A double room (with a bed of 160cm) with balcony on the bay.